Glyncorrwg village is set in the beautiful Afan Valley in south Wales far enough away from the madding crowd to enjoy some peace and quiet but close enough to get to – less than an hour from Cardiff. 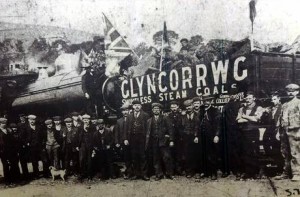 Glyncorrwg was once an important coal-mining centre, typical of the South Wales Valleys. With the end of the coal mining industry during the 1970s, buildings were cleared away, factories closed and people left the area to find new employment. In 1990 the local community decided to take advantage of the local scenery and complemented it with a series of ponds along the narrow valley. Trout fishing, coarse fishing, and canoeing are now popular sports in the area, plus miles of old flat railway trackbed lines and steep mountain slopes provide opportunities for cycling, hill-walking and mountain biking. The nearby village of Pontrhydyfen was the birthplace of actors Richard Burton and Ivor Emmanuel, and singers Rebecca Evans and Geraint Griffiths. The Richard Burton Appreciation Society is based in the village. 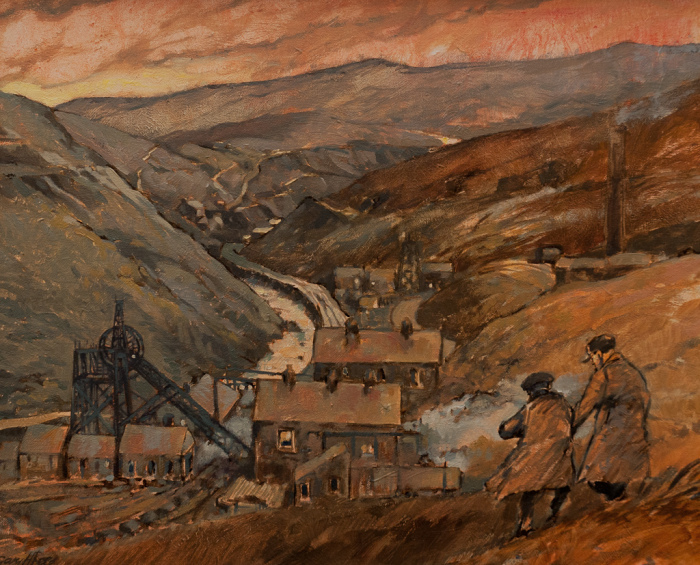 For some excellent oil paintings of Welsh mining scenes including Glyncorrwg, we recommenced that you take a look at the work of local artist, Gary Hamer Rees. Glyncorrwg Mountain Bike Centre This Mountain Biking Centre has superb facilities and is the trailhead for Whites level and Skyline mountain biking trails. There is also a bike shop, hire facility, café, bar, lounge area, open air deck, changing/shower rooms, a bike park and coarse and fly fishing lakes. Please Note: Some diversions are still in place on routes throughout 2015. Please see this site for the latest info on all local routes. Follow This Link to the NRW webpage and look for the ‘Closures and Diversions’ paragraph. 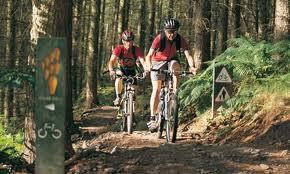 Afan A Blast Situated at the trail head Glyncorrwg Trails, shop for everything outdoorsy including bikes. Mountain Bike Hire We offer a limited cycle hire service to our guests, mostly aimed at small families – see here. 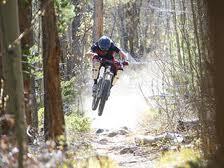 afanvalleybikeshed also offer a comprehensive service. Mountain Biking at Afan Forest Park The Trails in Afan Forest Park offer some of the most exciting and rewarding biking in Wales with swooping descents and technical boardwalks, there’s something for everyone. Also the ‘Rheilfordd’ family trail connects both centres and new blue & green all-abilities trails were added in 2012. Please Note: Diversions are in place on some routes throughout 2017. Darren Fawr Mountain Bike Trails New Mountain Bike (Blue and Black) Trails in the Garw Valley, opened January 2013. 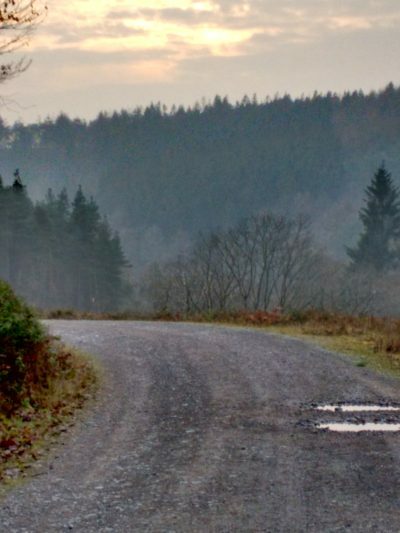 20 miles drive from Ty Skyline House, but midway between Cwmcarn and Glyncorrwg/Afan Argoed. Trails set off from Parc Calon Lan which has free parking and a visitor centre. Walking Within 200 yards of the front door, you will leave the village and be into some of Wales’ finest countryside. You could walk all day without crossing a road, plan to incorporate a pub lunch or just walk for an hour to escape the hustle and bustle of life. Some suggested routes are available at the house, or can be found on Afan Forest’s website and on the Ponds Centre’s website. 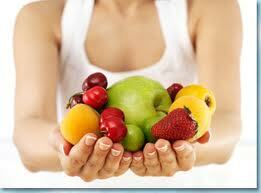 If you have any special requirements, let us know and we will do our best to provide for you. Fishing Set amidst the beautiful mountain scenery of the Afan Forest Park. 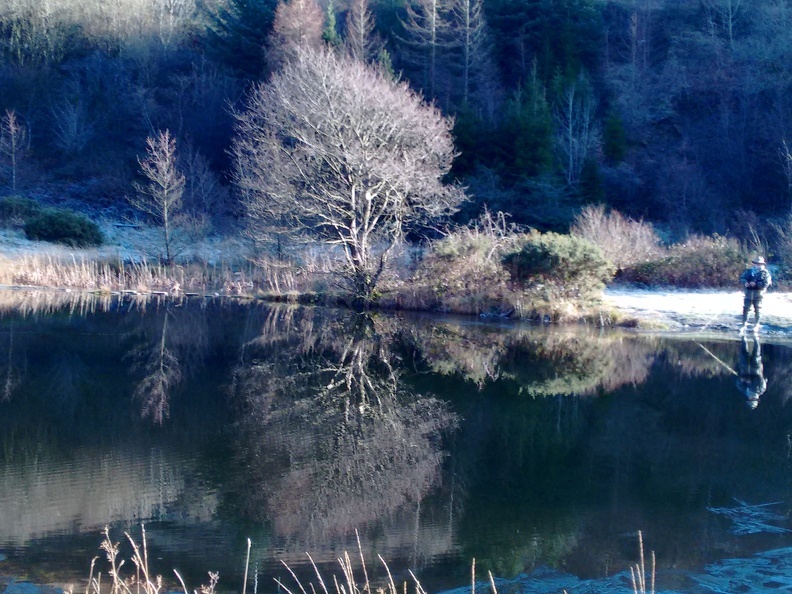 The Glyncorrwg Ponds Fishery started life in 1994, and lies beside the tree-lined valley. Fed by mountain streams and the river Corrwg, a tributary of the river Afan. The fishery consists of three man-made lakes, which are well stocked with rainbow trout up to 25lb in weight and two coarse lakes stocked with bream, roach, tench and carp, up to 38lb. 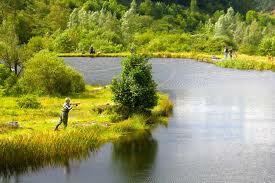 In 2007 the Glyncorrwg Ponds were voted one of the best stillwater fisheries in Wales by “Visit Wales”. 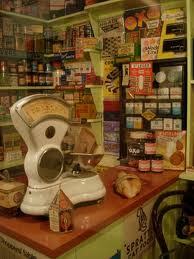 A small fishing tackle shop can be found in Duffryn Rhondda on the road to Afan Forest Park. Golf With 9 golf courses within 10 miles, Glyncorrwg is an ideal base for a golfing holiday. Glynneath Golf Club comes highly recommended but a full listing of local venues can be found here. 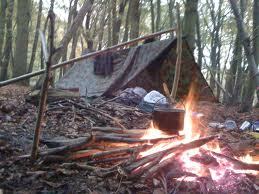 Outdoor Adventure Activities Bushcraft survival, paint-balling, off-roading, gorge-walking, clay shooting, quad biking, abseiling, canoeing. Perfect for a stag or hen party or any special occasion that you’re sharing with your best friends. 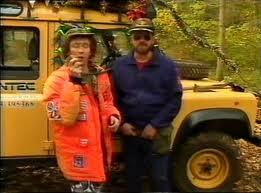 Its all available in south Wales. Including Gorge Walking in Pontneddfechan, Antur Outdoor in Port Talbot and Mountain and River Activities in Resolven. Use this search tool to find more. 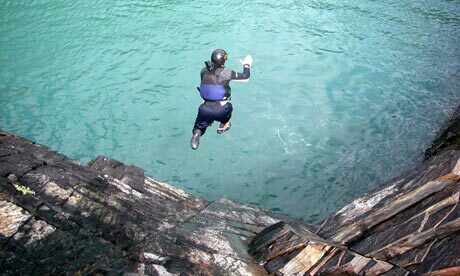 For the best in local Adventure, we strongly recommend Rip n Rock Adventure holidays. Cymmer Swimming Pool In the unlikely event that you don’t fancy being outdoors in the Welsh liquid sunshine, there is a local indoor swimming pool less than 10 minutes drive away. Ideal for a few hours to keep the kids happy. Indoor Gym If you a serious competitive athlete, you don’t need to suspend your training schedule just because you’re away from home. The Rugby Club, in association with the football and athletics club, operates a small gym that welcomes casual visitors for a very reasonable fee. Ask at the Rugby Club for more info. 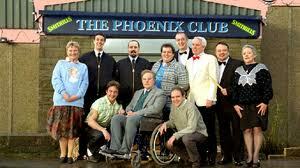 There are also various leisure centres within half an hour’s drive. Seaside Aberavon Beach is in the oldest part of Port Talbot and has plenty of all the usual beach activities going on. 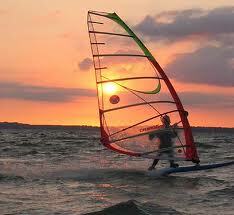 The Mumbles and Porthcawl are bit further away but are very popular water sports venues. The world-famous Gower coast beaches lie just beyond the Mumbles. Penderyn Distillery The home of the famous brand and several labels of Welsh Whisky. The visitor centre welcomes you to a tour that includes a couple of tastings. A shop stocks their full range of whiskies and other gifts and master classes in tasting are available. You may find some tasting miniatures at the house to wet your whistle. The National Showcaves Centre for Wales Also known as Dan-yr-Ogof, Wales’ famous wonderland of stalactites and stalagmites. Not to mention, the Iron Age Village, Dinosaur Park, Farm, Stone Circles and Shire Horse Centre. About an hour’s drive. Astronomy. Glyncorrwg is a top spot for the Dark Skies Discoveries project. See more info here and on Facebook here. Corrwg Cwtch Café at Glyncorrwg Mountain Bike Centre serves excellent food and drinks at reasonable prices every day of week. The bar is open late some weekends. Take Away Food A range of all the usual take away styles is available in the area and although some are outside walking distance, most offer delivery and their leaflets are available at the house. For Indian food, we recommend the Adhonik in nearby Caerau. Alternatively, you can have your meal delivered to Glyncorrwg Hall or the Rugby Club. Glyncorrwg Hall Who have a full set of take away menus available and will provide you with cutlery and crockery for the price of a pint. 01639 852499. The hall was once the village’s Working Men’s Club, typically seen in so many Welsh valley towns, but now serves as a local pub and community centre. Glyncorrwg Rugby Club A stone’s throw from the mountain bike centre, the club will also accommodate you for a take away – leaflets are available at the club. Visitors are always welcome. Entertainment Both the Hall and the Rugby Club often have live music and/or karaoke at the weekend. The Refreshment Rooms Restaurant in nearby Cymmer is an attractively-converted railway station and is highly recommended for Sunday lunch. You can get there with a 10-minute drive or build up your appetite with a good walk. The Afan Lodge Restaurant and Bar For a more refined evening meal we recommend a short drive away towards the Afan Forest Park. Proper BRITISH Fish and Chips For the best around, visit Wendells Fish & Chips on The Square Caerau. Friendly, prompt service and superb food for the hungry athlete! Fifteen minutes drive away. Another short drive away, near Pontrhydyfen is the excellent T Bones Inn and Restaurant ideal for carnivores after a hard day’s ride. Neath and Port Talbot are medium-sized coastal-towns with a wide variety of restaurants, bars and clubs within half an hour’s drive. Maesteg is a small valley town 15 minutes drive away well provided with places to eat, drink and even a nightclub. The Cross Inn Pub and Cerddin Micro-Brewery REAL ALE fans should love this local carbon-friendly brewery and pub in Maesteg. For those who don’t fancy the drive, we keep a few bottles of their best fayre at the house for you to sample. Groceries Delivered To The House! Jo’s Home-Made Cooking If you prefer to eat in after a busy day on the hills, you could – of course – cook for yourselves in our well-equipped kitchen. Even better though, you can have a meal pre-cooked and delivered to the house by our business partner Jo and her excellent catering business. This comes highly recommended by us. Riverford Organic Farms Organic veg, fruit, meat, milk, eggs and more – delivered to the house on a Friday to await your arrival. We have an account set up for the house, let us know if you are interested and we will give you the log on and contact details. Other Grocery Deliveries Asda, Sainsbury’s and Tesco all deliver to the house, but at present, Co-op, Ocado and Waitrose do not. You will need to make your own arrangements with these. Some of us can remember the days when the local grocery store had huge analogue scales on the counter to weigh out your produce – Glyncorrwg had one just like that until quite recently. Sadly it fell victim to the march of time. We still have a medium sized Premier store that can provide you with most of your needs, including some fresh fruit and veg, drinks and toiletries. 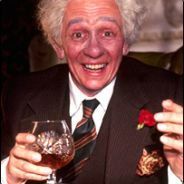 Pop along and see Raj, the friendly shopkeeper. There is also a post office in the village. 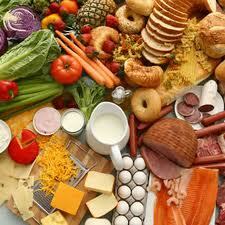 Supermarkets and hypermarkets are available at all the nearby towns. The nearest – Maesteg has a medium sized ASDA, Co-op and a large Tesco. Neath and Port Talbot have even more choice. For grocery deliveries, see above. Please note that all shops in Wales, including take-aways, must now charge 5 pence for each carrier bag. This is to encourage us to make use of more environmentally-friendly reusable bags. You may want to bring your own. Wales’ capital city, Cardiff is just an hour away and Swansea, made famous by the film Twin Town is even closer (DVD available in the house). There are several churches in the village providing regular services including Glyncorrwg Methodist Church in the next street. The nearby towns provide for all denominations and most faiths. See this directory for more information. We hope you don’t need any healthcare – but just in case – you will be well provided-for: There is a GP practice in the village, pharmacies in 2 of the neighbouring villages, a small hospital in Maesteg and A&E units in Merthyr and Bridgend. 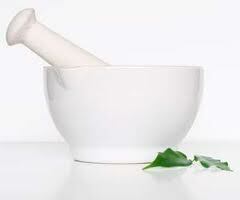 If you take more holistic responsibility for your health, you will be pleased to know that naturopaths are only a short drive away. I especially recommend Richard Burden in Swansea. 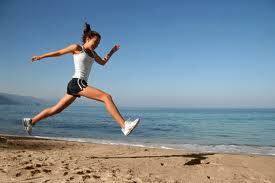 If you sustain any sporting injuries, please see our therapy web page for recommendations based on personal experience.